Increasingly the villages of the Hautes Alpes are adding via ferrata routes to the range of sporting activities offered here. If you are experienced you can simply go straight out there and do these routes, but for complete beginners you can hire a guide to take you in safety. 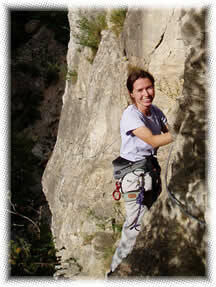 The words "Via ferrata" come from the Italian, meaning 'iron way'. The Italian army first used via ferrata to move troops and equipment of difficult ground in the alps. 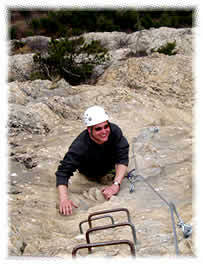 Via ferrata are scrambling or climbing routes over cliff faces and sometimes over whole mountains. In order to overcome the difficulties and dangers of the terrain these routes have steel rods and rails, steps and heavy-gauge wire cables fastened to the rock to assist and secure you. These routes allow the adventurous walker to enter the domain of the alpine climber, by clipping themselves safely onto the fixed via ferrata cable using harnesses, and specialised via ferrata equipment. 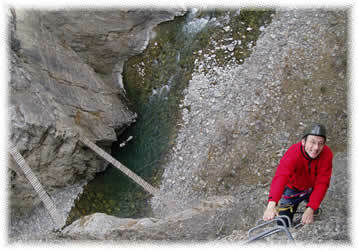 There is often a significant amount of hiking required to access and/or descend from most via ferrata routes. Is via ferrata a safe sport? As with any adventure sport, doing a via ferrata route involves an element of risk... however with the assistance of a professional and experienced guide, and high quality safety equipment, you should enjoy a safe and positive experience. No, via ferrata can be enjoyed by complete beginners. The guide will teach you the all of the necessary techniques for a safe ascent. For those with via ferrata or climbing experience you are not required to take a guide and more difficult itineraries can be chosen with care. When can I do via ferrata? Guided trips on the via ferrata routes can start as early as April through to the end of October (however this is weather dependent). If you are experienced it is possible to do via ferrata routes here throughout the year depending on the weather and your ability to cope with the cold! What via ferrata routes are nearby? AlpSun has apartments at Les Vigneaux and Puy Saint Vincent. These are just a few minutes from via ferratas 8 to 13 on the map below. What does it cost to go on a via ferrata? If you have sufficient experience to do via ferratas without the need of a guide and you have the correct equipment it will cost you nothing to access most of the via ferratas in this region. Guided trips cost between 40€ and 65€ per person and this will include the hire of any specialist equipment that you may need for the via ferrata. Trips are usually a minimum of a half day activity. If you are interested in taking a guided via ferrata trip as a part of your holiday in our accommodation then we can help you to arrange and book it. Don't hesitate to ask us.